This month Kasumisou Gallery is staging a pop-up shop offering their beautiful, hand-smocked girls’ cotton dresses for summer. The pop-up will be on the corner of Santa Cruz Ave. and Chestnut Street from 9:00 am to 1:00 pm on the next three Sunday mornings (June 17 and 24 and July 1). Kasumisou Gallery is a Menlo Park based e-commerce business specializing in goods made by individual crafts people and artisans or in small workshops utilizing traditional craft skills or by producers employing the disadvantaged. 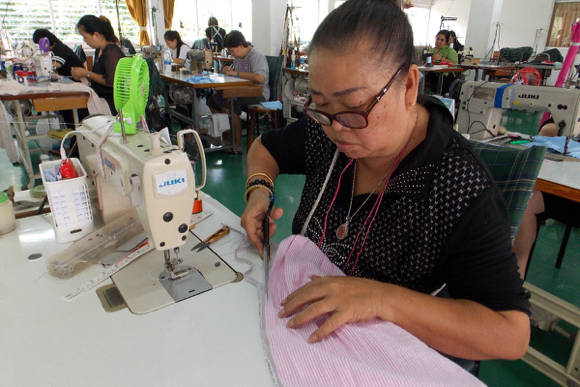 Their Princess Charming® brand hand embroidered smocked girls’ dresses are expertly sewn in a program for disadvantaged women in Bangkok, Thailand. The dresses are also available online at www.kasumisou.com. In conjunction with their Kasumisou Foundation — a Menlo Park based 501(c)3 charitable foundation founded in 1998 — local residents Mark and Barbara Rosasco have been supporting the women and girls at that shelter in Bangkok for more than 18 years. Menlo Park residents who might be interested in getting involved with supporting that program for extremely disadvantaged women and girls, many of whom have been the victims of physical abuse or trafficking, are encouraged to phone Kasumisou’s office (650-521-0515) or email [email protected].